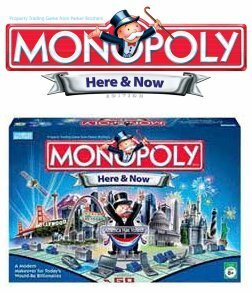 Earlier in the year, Hasbro asked players to vote for their favorite landmarks to be included in a new “Monopoly: Here & Now” edition. Americans cast more than 3 million online votes to shape the new edition’s game board and determine which landmarks from 22 cities made it onto the board, as well as the location of those landmarks on the board. America has elected New York City’s Times Square to occupy the highest rent property space (traditionally home to Boardwalk) on the game board of the new edition. The Big Apple shares the coveted blue property color group with its northern neighbor Boston, which landed its Fenway ballpark on the space traditionally occupied by Park Place. The rest of the high-rent district (which includes the green color group) features the White House (representing Washington, D.C.), Chicago’s Wrigley’s Field, and the neon-glittering Las Vegas Blvd (aka “The Strip”). Orlando’s Disney World occupies the red space traditionally known as Illinois Avenue, which has proven to be the most landed-upon property space on the board during a game. Cleveland’s Jacobs Field and Dallas’ Texas Stadium are the most affordable properties for real estate moguls to purchase, occupying the dark purple spaces. Beyond the new property landmarks, the new game has newly appraised property values and rents (players who land on Times Square with a hotel will pay $20 million), larger currency denominations, and airports replacing the railroad spaces. The game tokens have also been updated, and now include an environmentally-friendly hybrid Toyota Prius, a New Balance running shoe, McDonald’s French Fries, a Motorola RAZR cell phone, an airplane, and a laptop computer. The Chance and Community Chest cards, too, have received updated scenarios. For example, winning $10 in a beauty contest has changed to winning $100,000 in a reality TV show, and players are sent directly to jail (without passing GO) for such misdeeds as identity theft and insider trading. Note: This is an archive post; it was originally published on November 29, 2006.